Welcome to the Faculty of Psychotherapy Science. Sigmund Freud University (SFU) is a unique institution that pioneered Psychotherapy Science as an academic programme. The SFU was the first to introduce a university education in psychotherapy where academic and practical aspects work hand in hand and complement each other. We seek to set new standards for research and teaching by emphasizing research activities, practical training, and academic exchange. Innovative and student-centred teaching, finding and filling promising research niches and being the intellectual home for students keen on learning and growing, makes us a unique place to study. Our international academic staff will guide you in the lectures and in our outpatient clinics. 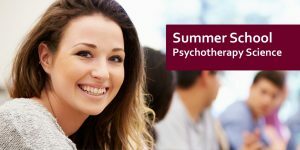 The English and the German programme both have the same curriculum and together constitute the Faculty of Psychotherapy Science. To learn more about studying Psychotherapy Science at SFU, join us at our next information evening.